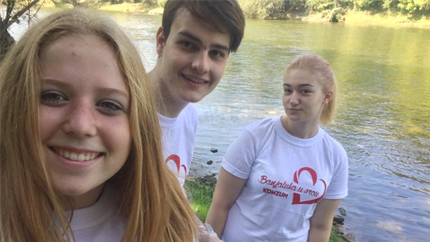 Tana (left) took a selfie with two of her new friends from school while performing a service project cleaning up the Vrbas River near Banja Luka. Tana Korhonen, a Kennedy-Lugar Youth Exchange and Study (YES) Abroad Program (YES Abroad) participant, has been named December’s American Abroad Student of the Month. Tana is spending the academic year in Banja Luka, Bosnia and Herzegovina. Tana is an enthusiastic and curious student who cares deeply about Banja Luka, serving her new community, and fostering mutual understanding between the United States and her host county through cultural exchange. A long way from her home in the Midwest, Tana has found a home in Banja Luka, and by virtue of her positive attitude, understanding, and tolerant character has become a beloved member of her new community. Tana has shown her willing, positive and thoughtful spirit by volunteering her time and energy to numerous events within her community. At her host school, Tana contributed to a video about bullying. With more than 50 other volunteers and NGOs, Tana helped seed new trees in a suburban area of Banja Luka and clean up a local forest and the banks of the River Vrbas. Tana also regularly volunteers at the American Corner in Banja Luka, and a children’s home and soup kitchen. In addition to community service activities, Tana has used her time to share American culture, history and literature with her host community. She gave a presentation on Halloween to her classmates and shared a poem by Maya Angelou in front of her entire school during Culture Week, which was attended by the mayor of Banja Luka and other prominent guests. She contributed to Halloween and Thanksgiving workshops for children organized by U.S. Embassy Branch Office staff. Tana also single-handedly organized a Thanksgiving dinner at her high school. Tara has gone a step further and shared the culture of her host county with her peers in America. She participated in International Education Week by conducting a virtual exchange with her American high school in Minnesota and speaking to several classes about her experience. Through her actions, Tana has proven herself to be an exceptional representative of the YES Abroad program and the United States. She has a true ambassadorial spirit.